When Seattle-base sculptor John Grade first headed to the Arctic, he was searching for the northernmost tree he could find. But, along the way, he was struck by something else: hills in an otherwise flat and open landscape. 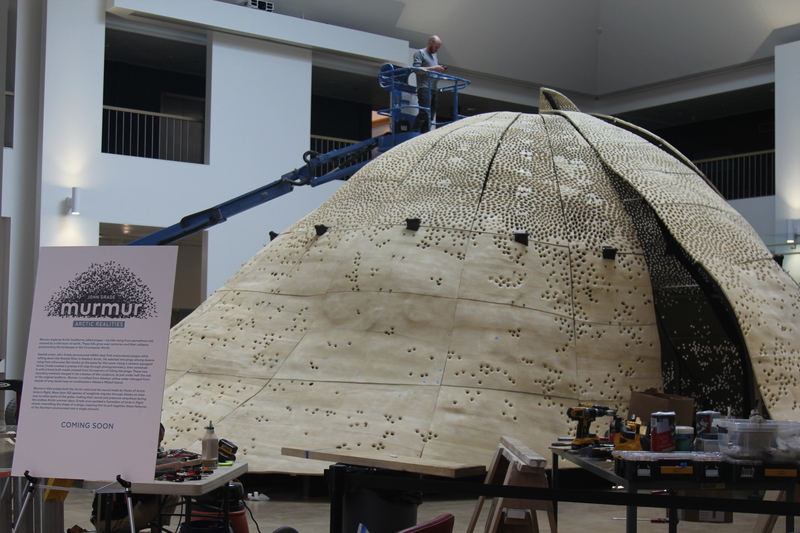 Those hills, called pingos, inspired his sculpture Murmur which opens at the Anchorage Museum on Friday. To design the sculpture, Grade spent three and a half days camping on top of a pingo and then used a drone to map it from above. The sculpture’s scale is impressive. The mound is 42 feet tall and almost as wide. It’s light brown and formed with different-sized panels made of salvaged Alaskan yellow cedar. They’re curved and splattered with small holes. 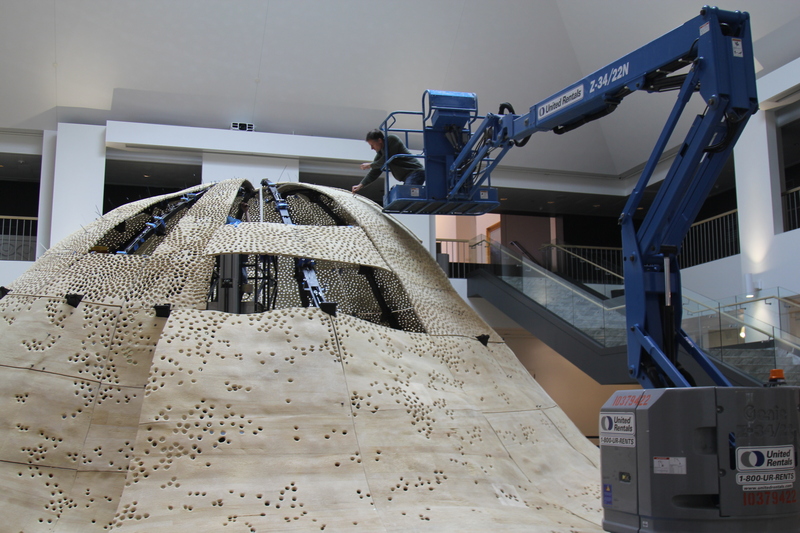 A member of his team rides a boom lift and peers in through the pingo’s top. Others sit around the edges staring at computer screens. 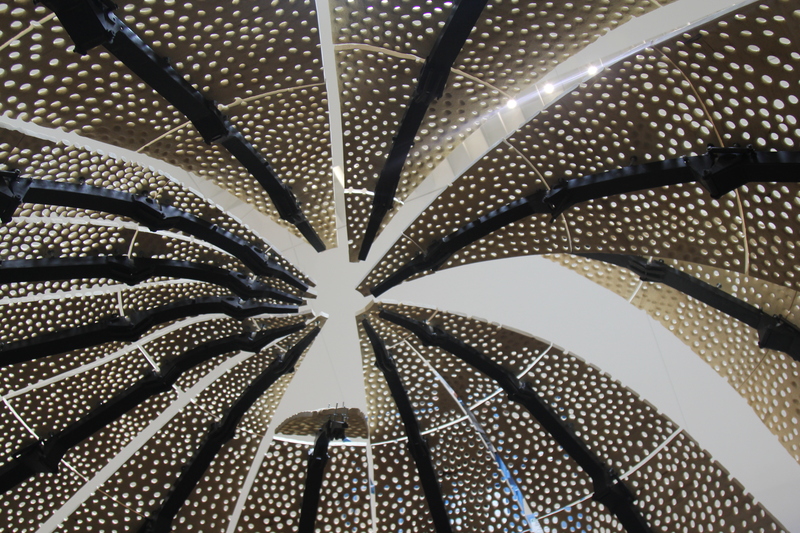 Three more work on the inside, testing out the sculpture’s moving walls. A trip to the Arctic through the Anchorage Museum’s Polar Lab program inspired Grade to make the sculpture. Hydrostatic or “closed-circuit” pingos form when a pool of water trapped beneath the ground freezes and forms something called an ice lens. Hydrostatic pressure forces the mounds slowly upward. Their cores are made of ice. As that ice melts, pingos collapse, forming lakes and then scars in the landscape. “They’re a very moving phenomena, and I think that they’re something that we can watch to kind of see how the climate’s changing in the Arctic,” Grade said. But it’s not just a pingo that Grade was looking to simulate for the exhibit. While paddling toward one on the Noatak, he watched a flock of birds create a murmuration that looked like the profile of a pingo. Murmurations are when birds dance together in massive, moving shapes. Most people associate them with starlings. Hence the name Murmur. Grade also wanted to give visitors a better sense of the Arctic environment through sounds and through visuals. To do that, he brought in Reilly Donovan, a new media artist. The exhibit uses something called augmented reality. Visitors wear HoloLens headsets that add sounds and holograms to their surroundings. Inside the pingo, a holographic ice core extends beneath the floor. Although scientists have cored pingos, Donovan and Grade mostly had to use their imaginations. “As you traverse the terrain, you actually start illuminating and revealing holograms that populate the floor space,” Donovan said. Grade and Donovan worked with a team of 20 to create the exhibit, including a computer programmer and a mechanical engineer. The exhibit will be at the Anchorage Museum until September before it travels internationally. It’ll return to the museum in 2020, where it will hang upside down from the ceiling, meant to symbolize the collapse of a pingo. “What’s most important to me, is that people come into the experience and they’re able to project their own ideas about what that landscape might mean and how it is to interact with other people within the exhibit as well,” Grade said.